Danger met me square in the face when I was about eight-years old and in the third grade. At this age, we believed ourselves one step removed from Superman and unabashedly invincible. We’d already achieved so much. My class was reading chapter books, perfecting our cursive and memorizing times tables…we possessed a knowledge unique unto ourselves. We were brave. Gallant. It was spring. The air smelled heavenly sweet, the morning dew glistened like diamonds on the emerald bed of grass, and there were a smattering of cottonball cumulus (yes, I think we learned that word in third grade science class) clouds in the crystal blue sky. Seated at the kitchen table dressed in my brown, yellow and white uniform jumper, I finished my breakfast and slung a brown backpack bearing my school’s logo – the mighty eagle – across my shoulders. My mom kissed me and my younger brother goodbye and we set off for the bus stop. My brother and I had to walk to the end of the block to our designated spot on Sandy Pass. To reach the bus stop, we had to walk past what was collectively referred to by the neighborhood kids as “the house.” Two doors down from our blue and white Victorian stood a bluish-gray cedar ranch. We seldom saw the occupants of the house, a working couple, and whenever we did, they were never very pleasant. This couple had no children but owned two sable and white collies as their pets. They were kept behind a gray wooden fence and you could always hear them growling and barking. Some neighbors felt sorry for the dogs, while others considered them to be a nuisance. Us kids secretly thought they weren’t dogs at all but savage wildebeests. 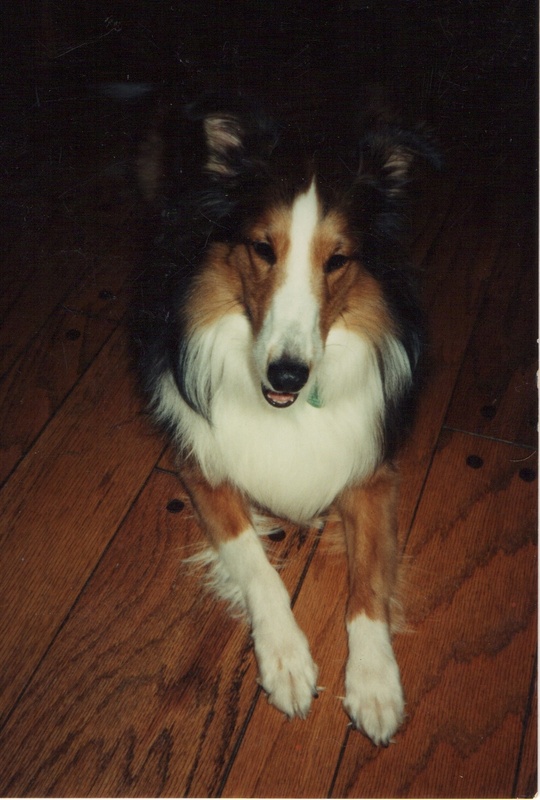 My dog, Heidi Satin Mittens who broke up sibling fights, loved jumping hurdles and was NOT a killer collie. This did nothing to relieve my jitters, but I didn’t dare admit this cowardice to anyone, not even acknowledge it in myself. The next thing I knew, those dogs bolted out of the fence like a shotgun and ran straight towards me! My little brother started running to the bus stop but if he felt any fear, the dogs didn’t sense his. They had found their prey…and it was me. I froze. How was a third grader supposed to defend her life from two ferocious collies? Proclaiming your bravery and courage is one thing, but acting upon it is something entirely different! Should I attempt to hit them with my backpack, hopefully rendering them unconscious? I sincerely doubted that would cause the flesh-hungry wolves any damage. After all, they’d probably chew right through my bag anyway. So, I did the only thing I could possibly do. I dashed back across the street, up our driveway and the sidewalk leading to the front door. I screamed, pounded my fists on the door and rang the bell. The door opened and I somersaulted through the screen door, collapsing on the wood floor. One of the collies removed his snout from the door’s pathway just in time before my mom shut it. Yes, I came that close to being mauled. “Those dogs almost killed me,” I informed my mother seriously, trying my best to defeat the tremble in my throat and the terror that pulsed through me. My mom nodded her head sympathetically, hugged me and walked me back to the bus stop. You’d think I would have at least been driven to school after a near brush with death. The owner of the collies had collected her dogs and penned them up in the garage. Evidently, the latch on the fence’s gate hadn’t been securely fastened and the collies were able to push their way out. She feigned an apology and said she hoped they hadn’t caused too many problems. But those collies did cause a problem. Their attack chipped away at my sense of invincibility, the illusion of Superman shattered, never to be repaired again. This entry was posted in Uncategorized and tagged afraid, attack, collies, danger, death, fear, invincibility, invincible, near death, Superman, third grade. Bookmark the permalink.